This master thesis evaluated the factors which determine the demand in the major Greek ports, in the liquid and dry bulk sectors using Stated and Revealed preference techniques. Ports all over the world and especially in the demanding area of Eastern Mediterranean are improving their quality measures day by day. A study which will reveal which are the main determinants of demand for shipping services in ports, will assist the major Greek ports of Piraeus, Thessaloniki, Kavala, Volos and Patra to develop their terminals in order to meet the expectations of their customers. 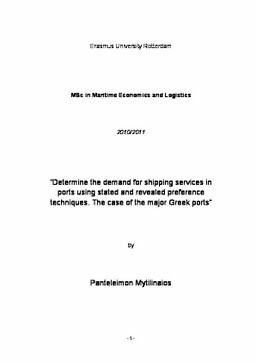 This thesis is focusing on answering two main research questions: Which of the two techniques, the Stated Preference or the Revealed Preference one, can best determine the demand for shipping services in the major ports of Greece? Which are the basic characteristics that determine the best quality shipping services in the major Greek ports in the liquid bulk and dry bulk sectors? A qualitative methodology was used in order to answer the main research questions. We prepared and conducted surveys to various shipping companies all over the Greek territory and close to the major Greek ports. The analysis of the surveys’ extracted data was conducted with the use of a polynomial model called Logit. The results of this master thesis were the following: 1. Stated Preference Technique can best describe and determine the demand for shipping services in the major Greek ports. 2. Three main attributes of the shipping services were selected to best determinate the demand in the major Greek ports and in the liquid and dry bulk sectors; Frequency of voyage, Total voyage costs and duration of voyage. These shipping service’s characteristics play an important role in the determination of the demand in the Greek ports. Through the results of the conducted surveys, this master thesis came upon the conclusion that a Greek shipping company is willing to pay the extra amount of money in their total voyage costs of their vessels if the frequency of the trips is increased and the duration of the voyages is decreased. It is up to the Greek port authorities to take this under consideration and seek for a continuous improvement in their services.